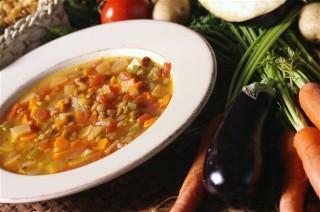 A vegetable soup diet can help you lose weight fast, but is the approach effective in the end? Weeding out fad diets and focusing on healthy eating plans that use soup to keep hunger at bay can help you achieve success. Part of the process includes understanding how soup helps people lose weight. Healthy soups can be naturally conducive to weight loss, and many soup-based diet programs have been developed to help people shed pound quickly. One of the most popular is the The Cabbage Soup Diet that uses a cabbage soup recipe as a foundation for the rapid weight loss plan. The cabbage soup diet gained popularity during the 1980s and several similar plans developed since then. Some are questionable while others use healthy principals including variety and rich nutrients. The 7 Days Soup Diet is a great example of a plan that uses soup as a foundation without cutting out other healthy foods. The BBC News Magazine article How Soup Can Help You Lose Weight explains how a vegetable soup diet can be effective in helping to shed unwanted pounds quickly and effectively. The article discusses the familiar experience dieters often face. Eating fruits and vegetables with water may satisfy hunger for about an hour or so, but feelings of hunger soon follow.Soups that contain healthy ingredients in a broth-based recipe offer vitamins and minerals in a satiating form. The difference between having salad and water for lunch and having a bowl of soup is the soup is naturally more filling. This is because the water in the broth is mixed with the food, making it stay in the stomach longer. Drinking water is an excellent way to promote weight loss. In addition, eating food that has high water content can maximize this approach by keeping water in the stomach longer, creating a feeling of fullness that lasts much longer. Including plenty of vegetables in the recipes is a great way to ensure that you are getting the right nutrients in the process. Jack Challoner is a science writer who explains ghrelin, a hunger-producing agent that increases in the blood stream when the stomach is empty. He describes ghrelin as the cupcake circuit that alerts the hypothalamus region in the brain that the body requires food. When the stomach is full, the cells of the body quit producing this element. Many vegetables are naturally conducive to weight loss because they help the body to burn fat. They do this is two ways. They burn calories in the digestive process. Some vegetables provide fewer calories than it takes to process them. In addition, they require bile for digestion. Bile is created in the liver, and it is a digestive fat that is necessary to process foods that are high in fiber. The liver retrieves the fat from cells that store the component in adipose tissues. The process is nature's internal liposuction, in which fat is pulled from the cells of the body in order to digest the fiber. Avoid soups that contain sausage and other meats for optimal results. Cream-based soups are not going to work because they are often packed with fat and calories. Even the reduced fat versions are not as effective because they contain less water.